A Secret Service agent stands guard as President Barack Obama walks to Marine One while departing the White House Jan. 15, 2015, in Washington, D.C. Adding to what is becoming a long list of President Barack Obama’s Secret Service agents dropping the ball or behaving inappropriately, the Washington Post is reporting that two senior agents attended a party, consumed alcohol and allegedly crashed their government car into security barricades that were positioned by the White House on March 4. 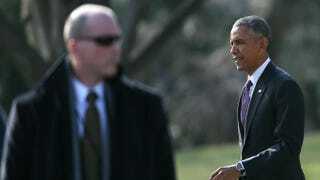 One of the agents is a top member of the president’s security detail, the Post reports. Other Secret Service agents who were at the scene reportedly wanted to arrest the two agents and test their alcohol levels but, according to the Post report, were told not to by a superior on duty that night. Secret Service Director Joseph P. Clancy said that an investigation of the incident would take place and be led by the Department of Homeland Security’s inspector general, given that the agents at the center of the investigation hold senior posts. Clancy was just appointed to his job last month after his predecessor stepped down amid a string of embarrassing incidents that had the American public questioning the Secret Service’s integrity and ability to protect the president. A spokesman for the Secret Service said that the agency will cooperate with the investigation. “If misconduct is identified, appropriate action will be taken based on established rules and regulations,” Brian Leary, an agency spokesman, said.